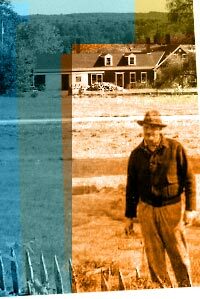 Chimney Farm, the rambling Maine home of naturalist-writer Henry Beston, has an unsure future. It was at Chimney Farm that Beston penned Northern Farm, his classic portrait of Maine life in the forties. Bestons writing influenced a whole generation of nature writers and The Outermost House, his chronicle of the seasons on Cape Cod, is considered by many to be a literary masterwork. It was at Chimney Farm that Elizabeth Coatsworth also wrote a number of her books as well. Economic and environmental pressures have put the 1814 farmhouses existence in peril. There is an effort underway to see that Henry Bestons home and the pristine area surrounding Damariscotta Lake is preserved for future generations. Deep Cove on the lake below the Farm is home to over thirty loons. It is hoped that the Farm, like the Outermost House, could some day be declared a National Literary Landmark and become a working symbol of the Beston legacy.